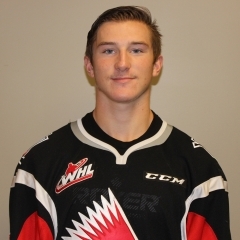 The Spokane Chiefs got a bit older on Monday; the Kelowna Rockets got younger.In a one-for-one exchange, the Chiefs got F Tanner Wishnowski, 19, for F Colum McGauley, 16.Wishnowski, a list player from Oakbank, Man., has a goal and an assist in 10 games in his sophomore season. As a freshman, he put up seven goals and six assists in 54 games.He is expected to join his new team in time for a game against the visiting Everett Silvertips tonight (Tuesday).McGauley was a fourth-round pick by Spokane in the 2015 WHL bantam draft. He is from Nelson, B.C., and is playing for the junior B Nelson Leafs of the Kootenay Junior International Hockey League. Last season, he had three goals and 15 assists in 39 games with the midget AAA Notre Dame Hounds, who play out of Wilcox, Sask.—— The Vancouver Giants have added D Jeff Rayman, 20, to their roster after claiming him off waivers from the Tri-City Americans. They placed him on waivers last week after acquiring G Rylan Parenteau, 20, from the Prince Albert Raiders. . . . The 6-foot-3, 210-pound Rayman, from Fernie, B.C., had a goal and seven assists in 86 games over two seasons (2013-15) with the Spokane Chiefs. He had three goals and two assists in 54 games with the Americans last season, and was pointless in seven games this season. . . . With the Giants, he joins F Thomas Foster and Russian D Dmitry Osipov as the 20-year-olds. . . . The Giants, who have won four in a row, all on the road, next play Wednesday when the Saskatoon Blades come calling to Langley, B.C. Tri-City at Portland, 7 p.m.Swift Current at Prince George, 7 p.m.Lethbridge at Regina, 7 p.m.Everett at Spokane, 7:05 p.m.Saskatoon at Victoria, 7:05 p.m.